The other night, Ryan found this little gem online. And let me tell ya, it's just to good not to share. 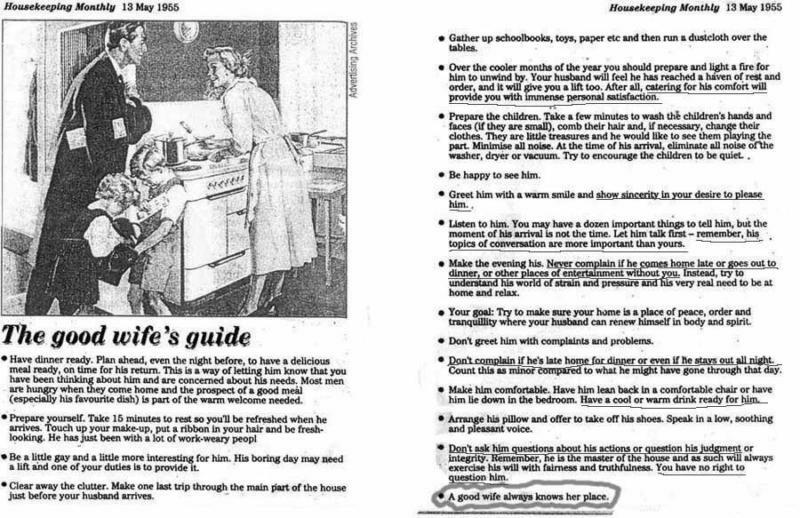 This was an actual article from Good Housekeeping in 1955 on how to be a "good housewife". Seriously. I can't make this stuff up. Being a good housewife is easy. This is all you have to do! According to Good Housekeeping, that is. Have dinner ready. Plan ahead, even the night before, to have a delicious meal ready on time for his return. This is a way of letting him know that you have be thinking about him and are concerned about his needs. Most men are hungry when they get home and the prospect of a good meal is part of the warm welcome needed. It's official....I'm a horrible wife. Prepare yourself. Take 15 minutes to rest so you'll be refreshed when he arrives. Touch up your make-up, put a ribbon in your hair and be fresh-looking. He has just been with a lot of work-weary people. You mean being covered in baby vomit isn't acceptable? I did not know that. Be a little gay and a little more interesting for him. His boring day may need a lift and one of your duties is to provide it. I need a drink. Clear away the clutter. Make one last trip through the main part of the house just before your husband arrives. Run a dustcloth over the tables. Why? During the cooler months of the year you should prepare and light a fire for him to unwind by. Your husband will feel he has reached a haven of rest and order, and it will give you a lift too. After all, catering to his comfort will provide you with immense personal satisfaction. 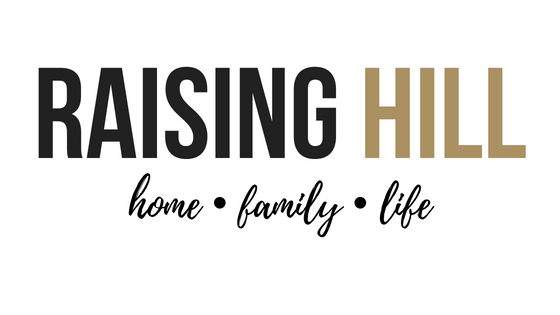 Immense personal satisfaction? Really?? Minimize all noise. At the time of his arrival, eliminate all noise of the washer, dryer or vacuum. Encourage the children to be quiet. Have you ever tried to get a kid to be quiet? Nuff said. Be happy to see him. Finally! Something I agree with....most days. Greet him with a warm smile and show sincerity in your desire to please him. Okay. I can put on a happy face. Listen to him. You may have a dozen important things to tell him, but the moment of his arrival is not the time. Let him talk first - remember, his topics of conversation are more important than yours. Excuse me?! More important than mine?!?! I don't think so. Don't greet him with complaints and problems. Okay??? Don't complain if he's late for dinner or even if he stays out all night. Count this as minor compared to what he might have gone through at work. Don't complain if he's late for dinner? Eh, that's fine. We all know I didn't cook anything. Make him comfortable. Have him lean back in a comfortable chair or lie him down in the bedroom. Have a cool or warm drink ready for him. Barf. Arrange his pillow and offer to take off his shoes. Speak in a low, soothing and pleasant voice. Have you met me? Don't ask him questions about his actions or question his judgment or integrity. Remember, he is the master of the house and as such will always exercise his will with fairness and truthfulness. You have no right to question him. I don't have a right to question him? I don't follow. A good wife always knows her place. I'm sorry. WHAT?!?! Like I said. Easy, right? So tell me, are you a good wife? Lol!!!! Wow, a,axing how things have changed. Based on this I'm like the. worst. housewife. ever. ! Thanks for sharing. I got a kick out of it. Love your blog. Your daughter is too cute!! Cheers to all the terrible housewives! This list really has some good points to it though...I like it.